The Podwits are back and firing on all cylinders! Dion and Brian parry on Spike Lee’s new Kickstarter project, the most infamous Jerry Lewis movie you’ll never see, and just what the hell comic legends Todd McFarlane, Mark Millar and Gerry Conway actually meant when speaking about women in comics. 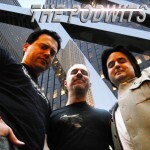 Yep, it’s gonna be a doozy—come have a listen to an all new edition of the Podwits Podcast! The footage that recently surfaced of Jerry Lewis working on his 1972 film The Day the Clown Cried. The Howard Stern interview with Harry Shearer about the Shearer’s viewing of a bootleg copy of The Day the Clown Cried. Todd McFarlane, Gerry Conway, and Mark Millar’s panel discussion promoting the PBS documentary Superheroes: The Never Ending Battle, in which they might have offended some female fans.